Both the conjoined Iranian twins have died during a marathon operation to separate them. Ladan Bijani was the first to succumb, shortly after surgeons separated her head from that of her sister. Laleh died an hour and a half later, hospital officials have confirmed. In a statement they said: "Raffles Hospital regrets to announce that the Bijani twins, Ladan and Laleh, have both passed away during surgery to separate them." Earlier, hospital spokesman Dr Prem Kumar explained that the 29 year-old sisters had both lost a lot of blood during the operation and were in a critical state. A team of 28 doctors and 100 medical assistants were involved in the surgery to separate the twins. As the operation progressed, it became clear the brains had fused together after 29 years sharing the same skull cavity, and the separation would not be as straightforward as anticipated. Surgeons spent some 21 hours cutting the twins' brains apart "literally millimetre by millimetre" - something that they had not expected to have to do. The final moment of separation came after 53 hours of the complex operation. The procedure was further complicated because the blood circulation between the twins was unstable. Dr Loo Choon Yong, chairman of Raffles Hospital, said that at one stage the specialists had stopped to consult the twins' next of kin. He said there was the choice of taking the twins into intensive care and off anaesthetic while the next stage was planned. This would have carried a risk of infection or even losing the twins in intensive care. The alternative option was to continue with the final stages of separation which would also be risky. "The team wanted to know once again what were the wishes of Ladan and Laleh," said Dr Loo. "We were told that they wanted to be separated under all circumstances." Half an hour after surgeons completed the separation, Ladan's circulation began to fail and, despite the efforts of the team, she died. 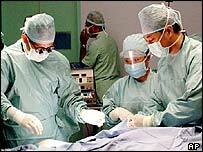 Surgery continued on Laleh but her circulation also started to fail and she died 90 minutes later. Dr Loo said: "When we undertook this challenge we knew the risks were great and one of scenarios was that we might lose both of them. "Ladan and Laleh knew that it too." The twins were warned that they had only a 50-50 chance of survival, but said they were willing to risk death for the chance to lead separate lives. Iranians living in Singapore had gathered at Raffles Hospital to pray for the Bijani sisters during the marathon surgery. After the news of Ladan's death, a group of weeping Iranian women were escorted away by friends. "I was shocked. I still don't believe it. Ladan was very friendly, she always liked to joke," said Hossein Afkami, 42. The operation marked the first time surgeons had tried to separate adult craniopagus twins - siblings born joined at the head - since the operation was first successfully performed in 1952. German doctors had turned away the Bijanis in 1996, deeming the operation to be too risky. The 29-year-old sisters were well-known in their home country for their courage and academic success - both graduated after studying law. Iranian government spokesman Abdollah Ramezanzadeh said that the nation was in "deep sorrow" following their deaths. "We were praying for them to be successfully separated, since that was their ultimate wish, " he told French news agency AFP. Iranian television went live to Singapore to bring the nation the sad news. 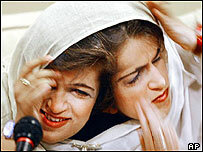 The BBC's Frances Harrison, in Tehran, said many people said they would be in mourning because the twins were like family figures after their lives had been charted by the Iranian media. "From the start this was high risk and unprecedented"